Tugboats fight the flames on the Deepwater Horizon oil rig. The disaster at the Deepwater Horizon oil rig was horrendous. Let’s make no mistake about that. Because not enough attention was paid to safety and environmental concerns before the explosion, an estimated total of 4.9 million barrels of oil (210 million gallons)1 were dumped into the ocean. The oil killed wildlife and will probably negatively affect parts of the environment for years to come. With that said, however, I want to look at the disaster from a scientific perspective. If nothing else, such a perspective will give you a deeper appreciation for the wonderful creation God has given us. The first thing you need to realize is how much oil seeps into the Gulf of Mexico naturally. Probably the best estimate done to date was published by the National Academies Press. It indicates that about 140,000 tons of oil (about a million barrels) leak into the Gulf of Mexico each year due to natural oil seeps.2 So the Deepwater Horizon disaster dumped as much oil as 5 years’ worth of natural seepage. Now, of course, there are some big differences between the way the Deepwater Horizon disaster spilled oil into the gulf and the way the natural seeps do it. First, the natural seeps release oil into the gulf much more slowly. Second, they release oil into the gulf over a wider area so it is not as concentrated. Third, since no one is trying to stop them, there isn’t all the pollution associated with engineers doing everything they can to stop a leak. As a result, the natural oil seeps do not produce the environmental devastation that the Deepwater Horizon disaster did. However, because oil seeps naturally into the ocean, you would expect that the ocean has a way to deal with it, and indeed it does. What we have seen already as a result of the Deepwater Horizon disaster tells us just how well the oceans have been designed to deal with oil pollution. 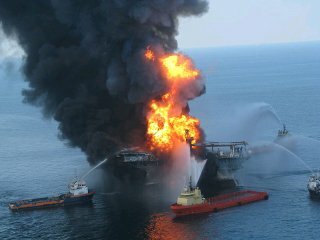 A recent study published online by the journal Science3 examined the dispersed plume of oil that came from the Deepwater Horizon disaster, and the authors note that the ocean’s “natural cleanup crew” is already working to reduce the effects of the disaster. What is the ocean’s “natural cleanup crew?” Well, when it comes to oil, it is a host of bacteria that love to feed on oil. Remember, oil seeps into the ocean naturally, and that oil needs to be cleaned up. The Designer of this planet understood this, of course, so among the plethora of bacteria He created are those that can digest oil so that it doesn’t build up in the oceans. Here, we report that the dispersed hydrocarbon plume stimulated deep-sea indigenous γ-proteobacteria that are closely related to known petroleum-degraders. So when they looked at the bacteria in the oil plume, they found ones that are very similar to other bacteria that are known to degrade petroleum. In the end, they say that the oil plume stimulated these bacteria. Of course, this makes sense. Give the bacteria more of what they want to eat, and their population will increase. The details of the report are even more fascinating. They analyzed the genes of the bacteria found in different parts of the oil plume, and they found that those genes varied depending on the specific hydrocarbons that were in that area of the plume. Remember, oil is a mixture of chemicals that contain hydrogen and carbon (hydrocarbons), and the molecules range from very small to very large. Thus, you might worry that these bacteria are good at degrading specific hydrocarbons but will leave others untouched. That’s not what the researchers found. Instead, they found that different bacteria tend to be better at degrading different hydrocarbons, and each type is found where the hydrocarbons they are good at degrading can be found. These results indicated that a variety of hydrocarbon-degrading populations exist in the deep-sea plume and that the microbial communities appear to be undergoing rapid dynamic adaptation in response to oil contamination. These results also imply that there exists a potential for intrinsic bioremediation of oil contaminants in the deep-sea, and that oil-degrading communities could play a significant role in controlling the ultimate fates of hydrocarbons in the Gulf. So at least based on this study, there is a good chance that a large amount of the ecological damage caused by the Deepwater Horizon disaster will be mitigated by the incredible design of the ocean and its inhabitants. Does that let BP off the hook? Of course not! Does that mean we shouldn’t work to keep this kind of disaster from ever happening again? Of course not! What data like these tell us is that the oceans were made for us, and even when we mess up royally, there are safeguards in place that will mitigate the effects of our mistakes. Let’s be thankful that God has designed our world so well, and let’s do everything in our power to make sure we don’t have to “test” His awesome design again! If we do everything in our power to prevent another spill, aren’t we denying His power? Besides, as you’ve shown, His awesome design will mitigate future spills. For the highest economic growth possible, shouldn’t we regulate deep water drilling about the same? Eric, I hope you are being facetious. We might be denying his power by preventing another spill, but we are being good stewards of what He has given us, which is a Biblical imperative. Following a Biblical imperative is much more important than worrying about whether or not we are denying His power. His awesome design will MITIGATE future oil spills, but that doesn’t mean there won’t be long-term consequences. “Mitigation” is not the same as “elimination.” Finally, it is in our best ECONOMIC interests to regulate deep-water drilling better. After all, what might be the most negative consequences of the Deepwater Horizon disaster are the economic ones. There is no way you can look at the money lost, the oil lost, the jobs lost, the litigation, etc. and claim that it is good for the economy. Thus, even for purely selfish reasons, we should try to keep this from happening again. I just think this is a pure science issue. I have a hard time thinking that God designed the oceans with a massive human-caused oil spill in mind. Eric, this definitely is a science issue, but I don’t separate that from God. Indeed, like many other scientists past and present (Linnaeus, Maxwell, Newton, Galileo, Pascal, Boyle, Joule, Robert G. V. Baker, Henry F. Schaefer, III, etc.) I see science as a way of discovering how God put His creation together. The fact that there are bacteria that seem to be able to adapt from feeding on natural seeps to feeding on oil from an oil well (which is different chemically, physically, and in location) indicate to me that God designed those bacteria as a failsafe. “I see science as a way of discovering how God put His creation together.” Well said, Dr. Wile. I think that is the true sense of science. My uncle is an inventor/shipwreck explorer, and he had to work for weeks on this project. He designed some little gadgets that stopped the leak (or something like that). It’s crazy to see how PERFECT this world is and how God doesn’t need US to run his world. Thanks, Lydia. I had no idea your uncle worked on the project. That is great! You are so right – God doesn’t need us to run His world! Wow!!! As a huge animal lover, seeing news footage of this incident makes it hard not to view it as anything but a tragedy. I still believe it is indeed, a tragedy, and we as God’s creatures should work to prevent it from happening again. Reading this post however, it took me only seconds to associate it with the wonder of our human bodies. Perhaps (because of the couple of beers I had before reading this post) I am not grasping this fully. To me it seems that the bacteria that react to the this oil spill are just like the (sorry if I don’t name them correctly – been a long time since high school or even college bio for me) white blood cells, antibodies, etc. that fight off bacteria and viruses in our own bodies. Please correct me if I’m wrong, but it seems the same amazing design that God had for the human body, exists also in our oceans. Those bacteria that crave the oil are always there, just as those awesome little dudes who fight disease in our bodies are always there. They just wait for the proper time to attack. Again, you know me. Never claimed to be a scientist, or even the kind of person who gets this kind of stuff…. but this association seem pretty clear cut. Am I missing something? And frankly, even if I am missing something, or perhaps, just not stating it correctly… Our God, is a really awesome God!!!!!!! As I have said before, Black Sheep, this is why I love it when you comment. The mechanisms by which they act are different, but your analogy is VERY good, and I am a bit upset that I didn’t think about it. Our white blood cells are always around, but when an infection occurs, they proliferate to fight it. This is very similar to what is going on with the bacteria in the Gulf. As a point of terminology, the white blood cells (which are alive) make antibodies (which are not alive). The antibodies do fight infection, and some of them stick around for a while, but they can’t proliferate, because they aren’t alive. I know this is a bit off topic, but I just wanted to say that we are all gung-ho fans of you and your books! 🙂 WE LOVE YOU MR. WILE!!!!!!!!!!!!!!!! Hi Joshua. Thanks so much for your kind words. In answer to your question, it is pronounced like “while.” The “i” is long and the “e” is silent. I just found your blog after hearing one of your “talks” on a homeschooling CD that included “The Best of the Best” homeschool speakers for 2010. You did a talk on Evolution vs. Creation and my husband and I thoroughly enjoyed it (as did my teen sons). I tried to leave a comment on your book review on the women who have been hurt by the patriarchal/quiverfull movement. Your review was great! I noticed you got some flak for having an opinion that opposed a very opinionate group, lol. Not that you care at all, but I agree with you….everything not in the Bible is NOT necessarily sin. I don’t see microscopes in the Bible, and I’m certainly not throwing mine out! I noticed you had Answers in Genesis listed in the links but you mentioned that their theology leaves a lot to be desired. Would you care to elaborate on this at all? I’m not by any means asking for you to gossip, bad mouth, or talk against this ministry, but I would like to know for various reasons what theology they hold that you do not adhere to. I noticed on the talk you gave that you said you were Arminian…is AIG Calvinist by any chance that you know of? Thank you for writing such GREAT educational materials btw! I tried a new science curriculum last year for physical science and only made it about 3 lessons into it before I realized that it was hazardous to our health…we were dying of boredom:) We promptly went back to our Exploring Creation series! Thanks for your comment and your kind words, MSchultz! Worpress (the software that I use for this blog) turns comments off after 14 days, which is why you can’t comment on the post. It was probably for the best, anyway, as the comments started generating more heat than light. The last one I listed is particularly relevant. AiG claims that no animal death before the fall is an ESSENTIAL doctrine in Christianity. In fact, it is at best an extrabiblical doctrine. thanks! :). So my Mom was wrong after all!